Elegant and stylish hoods from Smeg combine excellent performance with solid construction. Their sinks and taps are finished to a particularly high standard and are manufacturer from premium stainless steel. Smeg have created an iconic collection of toasters, kettles, stand mixers and blenders, all designed to add an extra level to both the aesthetics and performance in the kitchen. Not seen the category you're looking for? We have over 600 products made by Smeg. Italian Excellence - Aesthetic design combined with innovative technology results in unique products, which both look great and are highly functional. Renowned Design - Smeg have an incredible reputation for the design of their products, with many of their 50's style products being instantly recognisable as a Smeg product. Chosen by Professional Chefs - Combining design with outstanding cooking performance Smeg is the perfect solution for creative chefs. 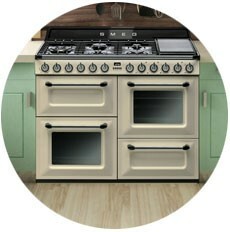 Great Performance - Smeg have utilised only the best materials to ensure long life and great performance. Know-how, creativity and style - A few of the qualities that have evolved from Smeg's Italian identity and characterises the company's commitment to bringing everyday objects to life.